More than 400 attendees crowded into the Encore Resort’s ballrooms for the 2nd Annual Las Vegas EB-5 Conference, hosted by EB5investors.com and EB5 Investors Magazine on January 17, 2015. 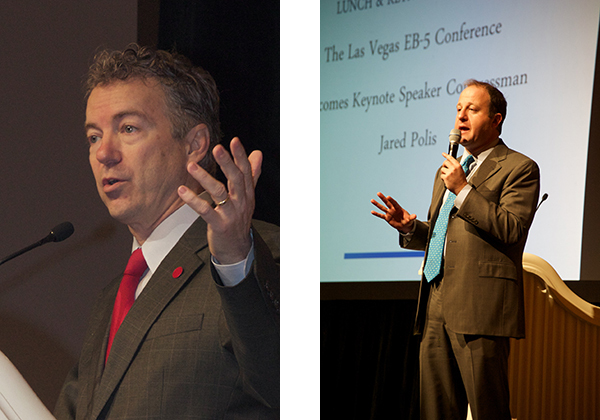 The conference welcomed Keynote Speakers Senator Rand Paul (R-KY) and Congressman Jared Polis (D-CO 2nd District), in addition to many speakers and sponsors. The sequel to last year’s impressive event, the 2015 conference produced another sold-out crowd for the one-day gathering of regional center representatives, attorneys, and developers. The conference kicked off with a breakfast keynote address by Senator Rand Paul. The senator discussed his enthusiasm and support for the EB-5 program, as well as his commitment to improving it through legislation. He also emphasized the increasing need for programs like EB-5 to inject much-needed money into the American economy. After Senator Paul’s speech and breakfast concluded, the dual track panels began. The panels were split into beginner and advanced tracks, offering those with all levels of EB-5 knowledge an opportunity to learn something new. Some of the moderators for the first round of panels included Mona Shah from Mona Shah & Associates, Kate Kalmykov from Greenberg Traurig, LLP, and Jim Butler from Jeffer Mangels Butler & Mitchell LLP. 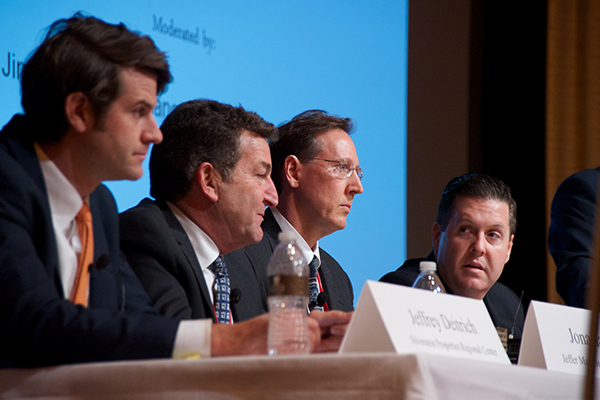 These first panels touched on topics ranging from the basic, like “Introduction to Raising EB-5 Capital,” to the more advanced, like “Heightening Due Diligence in the EB-5 Program.” The moderators and panelists offered their keen insight and unique perspectives to a wide variety of attendees. They also offered Q&A sessions at the end of their discussions. As lunchtime rolled around, the main ballroom was once again packed full for Congressman Jared Polis’ keynote address. Congressman Polis emphasized the need for the program to be made permanent through legislation. He argued that EB-5-related legislation should expand the program rather than hinder it. The congressman also spoke about minimizing potential fraud through increased funding and transparency. After lunch, there were still 6 panels left. Moderators for these panels included among others, David Hirson from David Hirson & Partners, LLP, Jeff Campion from Pathways, and Bernard Wolfsdorf from Wolfsdorf Rosenthal LLP. While the beginner panels touched on topics like “Structuring EB-5 Projects for Immigration, Financial, and Market Success,” and “Traditional Financing vs. EB-5,” the advanced panels discussed more prominent EB-5 issues like, “Assessing the Impact of an EB-5 Backlog on the Chinese Market and Project Funding,” and “Analyzing Possible 2015 Legislative Changes Impacting the EB-5 Program,” with Congressman Polis and EB5 Investor’s Ali Jahangiri. The latter panel allowed Congressman Polis to interact directly with attendees and address their individual concern and questions. Breaks between panels allowed ample time for attendees to network, display their promotional materials, and build valuable industry connections. However, the cocktail reception after the conclusion of the panels was where the real networking began. The reception brought the entire attendance together for an unparalleled networking opportunity. Attendees had the opportunity to meet panelists and sponsors, building relationships that will only strengthen the EB-5 industry. Attendees remarked that the conference was an even greater success than last year’s Las Vegas conference, but it was really because of their support for the program that the conference was possible. If you didn’t get a chance to attend this year’s Las Vegas Conference, don’t worry; there will be another Las Vegas EB-5 Conference next year in addition to the 2015 Los Angeles Conference coming this July!